Ask fellow campers about "Double Lake Recreation Area" and nearby attractions. Beautiful park on the lake. Your choice of water/electric or full hook-ups. Paved walking path around lake. Great group camping facilities. We camped at Double Lake Recreation Area in a Motorhome. We had a great time... for August camping in Texas. We almost had the entire place to ourselves. Only 3 other sites were occupied. On RV door side (passenger) the next spot was 50 yards away through thick brush. On the other side (driver) the next spot was only 15 yards away and clearly visible should you look back there (we did not). From the camper's bumper, the lake was just 20 yards away. A great spot that we will try to get again next time.The kids enjoyed the swimming area which was clean and well maintained. We camped at Double Lake Recreation Area in a Travel Trailer. This a nice small park. There are several pull-throughs which have full hookups and can handle big rigs. There are not any sites which you could really call lake view due to the heavy forest. The swimming area is really nice. Verizon service is a little spotty but usable. Like Cagle Rec Area, your America the Beautiful discount is screwy, not really half price like most USFS and COE parks. We will probably come here again. We camped at Double Lake Recreation Area in a Fifth Wheel. It is close to Coldspring where you can get grocerys and fuel. 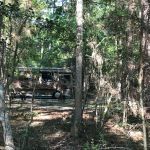 Update review 11/2016 - This is one of our favorite places to camp in our RV. 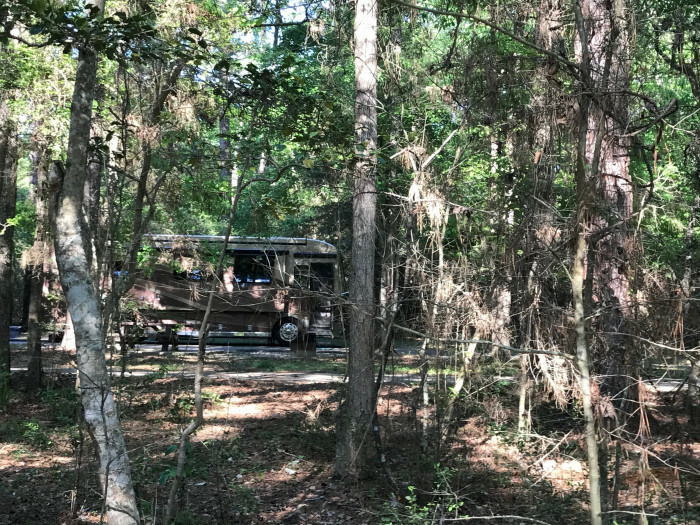 This is a very small camping area in the Sam Houston National Forest near Coldspring Texas. There are sites you can reserve and sites that are first-come-first serve. There are 2 park hosts that live in the park and they are very accommodating if you need anything, but don't expect to see a constant presence by park staff. 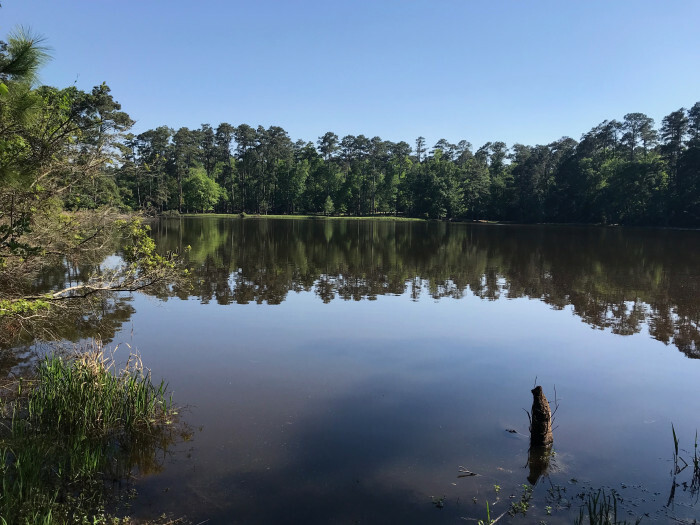 The park is a beautiful forest like facility with very wooded and shady sites, a small lake with plenty of water in it (after a couple drought seasons) and abundant hiking and biking trails. We only camp on the full service RV sites. (Not all sites are full service.) Some sites are reasonably level and some require substantial leveling efforts. Just make sure you have plenty of Lynx levelers or equivalent. The pedestals are conveniently located with 30/50 amp service, water and dump. The sites driveway is blacktop and most sites have a concrete pad with a large picnic table and a nearby fire pit. Cell service and TV reception are weak, so don't plan to watch a lot of TV unless you have a satellite system. We camped at Double Lake Recreation Area in a Fifth Wheel. This is a great park for fall and winter camping. The small lake has struggled the past few years due to drought conditions in this area so there is not much to do as far as the lake is concerned. However, there is plenty to do if you like hiking or biking the trails, shopping in the nearby town of Coldspring (they have their monthly town square trade days the last Saturday of the month), visiting the historic jail house, or eating at the old style dinner in town. We always reserve one of the full hook-up sites that are paved, reasonably level with a good hook-up pedestal, and that is appropriately positioned. The satellite TV reception is OK, but not great; and the antenna TV reception is poor. This is because of the remote location and abundant tree coverage. The rest rooms are typical Forest service facilities. Not outstanding but adequate. Since we have full hook-ups, this is not an issue to us. The park is shady and very beautiful on a cool crisp fall morning. We have been coming to this park for years and will continue. We camped at Double Lake Recreation Area in a Fifth Wheel. Just stayed here at spot 60. Highly recommend this place. Really enjoyed the it, no troubles at all, bath rooms are dated but kept pretty clean. I really didn't see any trash anywhere in the park. Great hiking trails and saw a bunch of kids on bikes so I think they have biking trail as as well but cant swear to it. RV sites are very spacious, ours wasn't real level but for the layout, I will take it any day, hiking trails are nice. AT&T service spotty but you can get a signal most places, Satellite signal a bit tough to get cause all of the trees but would much rather have the trees around us like we did. No dump station but park manager said just pull through one of the open drive through spots with full hook ups and dump there. Only negative thing I can say about this place is I think the park host needs to to tidy up their site, stuff laying around their RV really takes away from the place and be put away and in order like the rest of the park. With that being said, they were super friendly people. I don't think anyone will be disappointed staying here. We camped at Double Lake Recreation Area in a Travel Trailer. Interior roads and sites paved and easy to navigate with the motorhome. Heavy tree cover made satellite service impossible to get. A quiet campground; park was not busy at all. We were on site 051. Sites tend to slope either toward road or rear so significant leveling may need to take place depending on site. We would consider returning to stay here again. We camped at Double Lake Recreation Area in a Motorhome. Very nice Forest Service park with fairly level paved sites. Very brushy, so that next neighbor is hardly visible and very distant. Nice walking path along the lake. Due to current conditions in Texas, the lake is dry and there is a burn ban, but these things cannot be helped. We camped at Double Lake Recreation Area in a Motorhome. I really liked this campground. Lots of trails and trees. Has a nice swimming area also. The spaces were really large. Everyone was very nice. We couldn't get much on the TV and my cell would not work at the site (t-Mobile), but we wanted to relax anyway. There are nice family type restaurants close by, if you don't want to cook. Has a picnic table and grill at the site also. They have group camping if you need it. We camped at Double Lake Recreation Area in a Fifth Wheel. This park offers a number of hiking and bicycling trails, not to mention canoe, paddle boat or fishing on or around the lake. The designated swim area is in the day use area on the other side of lake from our site. Very wooded, makes for a sense of privacy between sites but also limits satellite reception. Sites were spacious with tables fire rings lantern poles and some with full RV hookups. The nearest restroom/shower facility to our site was out of order making the next closest a bit of a hike. Perhaps it was just the time of year, but the flies were terrible, with literally hundreds attacking anything edible placed on a table outside. We actually filled a fly trap jar (used for stables) over the weekend we were there. Next time we will bring the canopy with bug screens. We camped at Double Lake Recreation Area in a Motorhome. This is a concessionaire managed, US Forest Service facility. The positives for this campground it is big rig friendly with paved access roads, easy in and out, and all sites are concrete or paved. Full hook-ups and pull thru’s are not the norm, but are available thru out the campground. Space between sites is abundant. Each has a picnic table and fire ring/grill. Water pressure and voltage was good. There is a nice separate tent area only, also spacious, but without hook-ups. Bath houses are conveniently spaced thru out the campground. There are two small lakes and nice biking/hiking trails. One lake has a pavilion, seasonal concession, and designated swimming area. The negatives are that the access roads have some potholes and crumbling pavement. Most sites will require some higher degree of leveling - more for longer rigs. The bath houses aren’t heated, there is no laundry or playground, dump station, and the single dumpster is not within walking distance of the campsites. Satellite reception will only be possible on a few sites and good TV reception is also minimal. The Golden Age and Access card is recognized, but only for a discount instead of the normal half price fee. Without this discount the cost is comparable to a commercial CG with more amenities. My rating is a reflection of a few too many negatives and the high price for a site. But, if the intent of one’s visit is to take advantage of natural surroundings with camp site privacy, then this is a good place to do it. We camped at Double Lake Recreation Area in a Motorhome. Awesome park! There are several miles of walking and mountain biking trails. 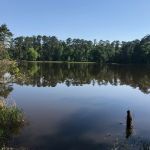 Also a small 23 acre lake with catfish and bass with many fishing piers and benches for just enjoying the view. The sites are huge and most accommodating just about any size camper with multiple slides. The park is very clean and well maintained and the staff is very helpful and friendly. We will return many times a year. This park is a jewel. We camped at Double Lake Recreation Area in a Travel Trailer. This is a very nice, quiet park. Most of the sites are spaced farther apart than the state parks in the region, giving a lot of seclusion to each site. A few are alongside each other, allowing two RV's to camp together. Outside our windows, all we could see were trees. We did have to do some leveling. A few very large pull through sites are available, but most are back-in. The operation of the campground has been taken over by a concessionaire. We didn't see a lot of park employees, just someone who dropped off our pass as we were setting up, as we had reserved and paid ahead. The entrance gate was unmanned the whole time we were there, apparently this is still off-season. The park is actually very near the town of Coldspring, even with the secluded feel of the spot. All in all, a very nice park. The overnight fee given does not include the on line reservation fee. We camped at Double Lake Recreation Area in a Fifth Wheel. We have stayed here twice in the past 5 months and were not disappointed either time. Really nice and private sites surrounded by forest. Nice long trails for walking and biking. A swimming lake to cool off and lots of picnic areas. They also have boat rentals. We camped at Double Lake Recreation Area in a Travel Trailer. This is a US Forest Service campground and it is immaculate. I almost hate to advertise it and keep it a secret. It has paved roads, paved sites and the grounds are very clean and maintained. Sites range from full hook up to primitive. Has small lake for fishing, boating (canoes, paddleboats, that type) and plenty of walking trails. Very quiet and in the middle of a national forest. There are also double sites if you are going with a friend that also has a trailer or RV. Several pull throughs and all of the back-ins are easy to get into for even the most novice backers. Staff and workampers are very helpful and cheerful. Doesn't have swimming pool, but does have roped off area and beach on lake. We camped at Double Lake Recreation Area in a Fifth Wheel. Are you affiliated with Double Lake Recreation Area ?